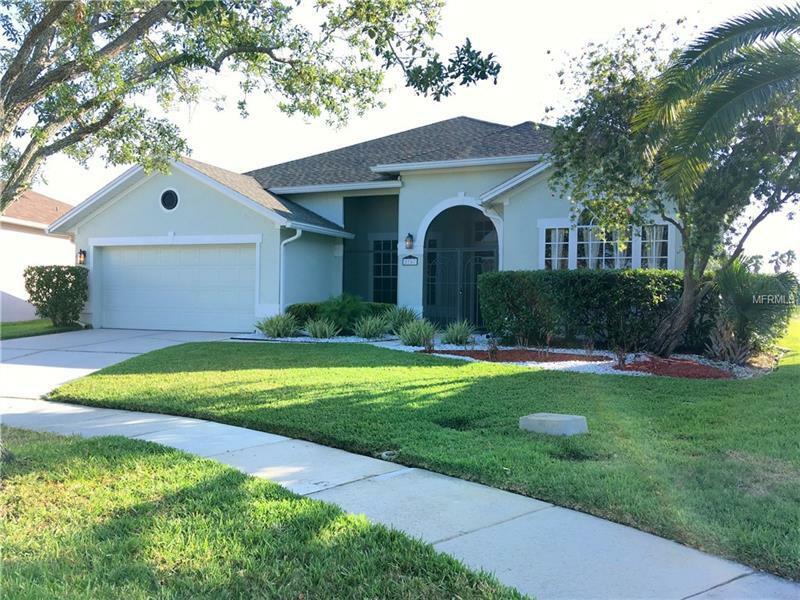 Well-appointed pool home with water view in golf-course community. Tucked away near the 17th fairway is a home you will really love. The front porch is screened with a wrought-iron gate. Just inside the tiled entry is the office, with a large walk-in storage closet which is plumbed for a half-bath. The formal dining room is to your right, and straight ahead is the huge living room, with crown molding at the high ceilings, and wide windows that really let in the light. The fully equipped chefâs kitchen has an island with cooktop/grill and cabinets below, plus a range and closet pantry. There is plenty of cabinet space here. The kitchen has room for a breakfast table which has a lovely view of either the pool or the water. The master suite features a large bedroom with sliding door to the pool deck, and private bath with two sinks and a makeup vanity, garden tub with whirlpool, glass step-in shower, glass-block exterior wall for privacy, and huge walk-in closet. The three other bedrooms share the second full bath. From the kitchen enter the pool deck with calming view of the fairway, trees, and the water. You barely notice the neighbors. Updated features include AC and heat pump replaced in February 2017, new roof less than three years old. Conveniently located near FL Turnpike, Orlando Intâl Airport and all that Orlando has to offer. Come home to Central Florida, where it hardly ever snows!